School of Computer Science graduate, Luke Thompson, recently attended the Find Your Feet Careers Fair at the University of Lincoln. We were delighted to see Luke back on Campus and caught up with him about his new role on the IT Leadership Programme (Graduate Scheme) at Dunelm. Read on to find out how Luke’s experience at Lincoln helped prepare him for the world of work! 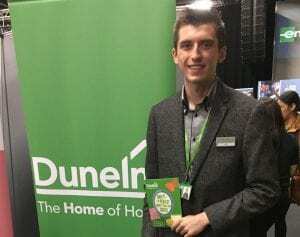 “I am currently on a 2 year rotational programme with Dunelm. The scheme is designed to encourage future leaders of the business and expose us to all areas of what is a very interesting and diverse, yet still relatively small business. The first part of the scheme, which I have recently completed, was a placement in store as part of the management team in one of our 160+ retail stores. Not what you would expect for an IT grad, however, as a business we put the customer first and understanding all of the differing technologies that enable our stores to sell efficiently is integral. This experience will form my first report to the directors board who take an active role in the development of all the graduates. From there, I moved to a project that has been working on the onboarding a recent acquisition of an online business, including 3 brands. Once I have completed this rotation, I will move onto specific IT rotations across IT Programmes, IT Services, Online services and Architecture and security. It’s likely I will be working on some of these integrations as well as upgrades to ensure that the customers, in store or online, have new and inspiring ways to shop. My time at the University of Lincoln was amazing, but not without challenge and hard work. Having recently been back at Lincoln to attend the Find your Feet Careers Fair, I remember the position I was in only a year ago applying for jobs and pretending my final year project didn’t exist- it did and that deadline will come however much you put it off! However, I can honestly say the hard work was worth it and I was in the lucky position to be able to choose from graduate offers to get the right role for me. I look at the facilities now and I am amazed at how things have come along and what a great position students of the School of Computer Science are in today to be employable when they reach the end of level three / four. It’s great to see Luke is applying his skills and knowledge learnt during his time at Lincoln and we wish him the very best in his future career! You can find out more about the School of Computer Science online.